Why Can’t I Sleep Anymore?! Can you remember the last time you slept all the way through the night undisturbed? If you’re over fifty and regularly experience insomnia, restless nights, and struggle to find enough energy to make it through the day, your sleep issues could be related to natural changes that happen as you age. Not to worry! I have some tried-and-true tips to get your sleep back on track so you can spend your days doing your favorite activities, and being there 100% for the people you love. 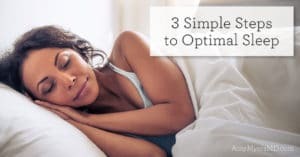 First, we’ll look at some common causes of sleep disturbances in midlife, and then we can dive into natural solutions you can use to overcome these issues and enjoy a peaceful and restorative night’s sleep. Did you know that we spend one-third of our life asleep? Anything we spend that much time doing certainly can’t be neglected. Sleep is vital not only for restoring your energy, it’s also involved in learning, creating new memories, and clearing out the toxins that build up in your brain during the day. It plays a crucial role in numerous bodily processes including metabolism, immune function, and mood. So what is the “sweet spot” for hours of sleep we should target? The typical range for healthy sleep is between seven and nine hours per night. That being said, every person is different and your needs for sleep may vary over time. Studies have shown that older adults require less sleep to feel fully rested than young adults,3 so if you’re sleeping less now than you once did, it may not be a problem at all. What’s most important is how you feel during the day. 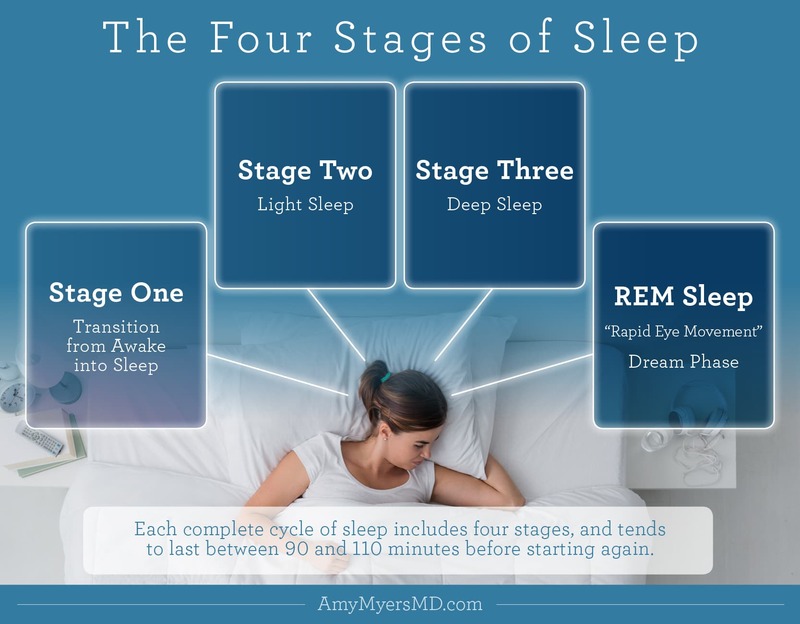 REM Sleep: An abbreviation for “rapid eye movement”, REM sleep is the stage of sleep when most dreaming occurs. Your eyes move quickly from side to side, your breathing gets faster, and your heart rate and blood pressure increase. REM sleep first occurs roughly 90 minutes after falling asleep, and the REM stage grows longer with each sleep cycle as the night goes on. As you age, you tend to spend less time in stage 3 and REM sleep and more time in stages 1 and 2.8 This could help explain why you may not feel as refreshed in the morning as you enter midlife. What’s more, memory consolidation requires both REM and non-REM stages of sleep.9 So-called “slow-wave sleep” (the type of deep sleep you get in stage 3) is necessary for fact-based memories, while REM sleep is needed for consolidation of emotional and procedural memory (which includes motor skills and automatic activities such as walking and talking).10 This may be why you can experience greater memory loss as you get older, especially if you struggle to get a good night’s sleep. Although not well understood, age-related changes in sleep patterns may be due to declining levels of the “sleep hormone” melatonin as you age.11 Because of these natural changes in circadian rhythm, people over fifty spend less time in deep, restorative stage 3 and REM sleep.12 This leads to more frequent insomnia, abrupt awakening, or waking up multiple times during the night. There are also a number of health issues that increase with age that could be behind your sleepless nights. As you age, your body produces less and less melatonin (the “sleep hormone”), which is one reason why so many older adults struggle with insomnia and other sleep issues.17 Women going through menopause experience additional hormone imbalances, including a decline in estrogen, that can cause night sweats and other symptoms that interfere with good quality sleep.18 In turn, disrupted sleep can wreak havoc on hormone balance, creating a vicious cycle. These are just some of the issues that can arise in midlife and rob you of your sleep. Fortunately, no matter what is causing your restless nights, there are many proven approaches for improving sleep quality. Let’s take a look at some of my favorite natural sleep solutions to help you feel well rested and ready to tackle your day! 1. Establish good sleep habits. Though it may sound simple, training your mind when and how to fall asleep can actually help train your body too. This is because of what is known as your body’s circadian rhythm, the 24-hour cycle of sleeping and waking controlled by your brain. Your brain tells you when it’s time to go to bed by releasing melatonin.19 Darkness cues your brain to start producing melatonin, and light signals it to stop. Before electricity, melatonin would be released when the sun went down, so people would sleep when it was dark and wake when it was light. 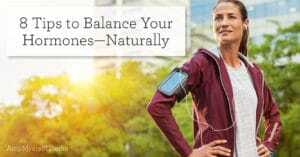 Now that we’re surrounded by bright lights and light-emitting technology at all hours of the day, our natural circadian rhythms get thrown off. Go to bed and wake up at the same time every night. Use blackout shades or an eye mask to block light from street lamps. Find out more tips to build healthy sleep habits and reset your sleep cycle in this article. 2. Turn off the electronics and wear amber glasses. The best course of action would be to turn off all technology about 2 hours before bedtime, and dim the lights to help stimulate melatonin production. Choose a relaxing activity that doesn’t involve a screen such as reading, taking a bath, light stretching, or meditation. That being said, sometimes using technology before bed simply can’t be helped. You may need to complete a project by a certain deadline, or maybe nothing else relaxes you more after a hard day’s work than catching up on your favorite shows. If you find it difficult to limit screen time before bed, invest in a pair of amber glasses. The tinted lenses block blue light from entering your eyes, so it won’t disrupt your natural sleep cycle. Amber glasses were a true game-changer for me. 3. Avoid alcohol and caffeine. Alcohol and caffeine are both toxic compounds that I recommend avoiding no matter who you are. However, it is especially critical to eliminate these substances if you are having trouble sleeping. As I mentioned above, alcohol and caffeine play a role in Restless Leg Syndrome, which can keep you up at night. Plus, they both stimulate the bladder, increasing your risk of nighttime incontinence. To replace your coffee habit, try switching to caffeine-free herbal tea. Chamomile, tulsi, lemon balm, and passionflower are especially relaxing choices to sip before bed. As for alcohol, save imbibing for special occasions or opt for a “mocktail” if you’re just looking for something bubbly, tangy, or sweet to drink. I have a number of fun (and delicious!) ideas for mocktails in The Autoimmune Solution Cookbook so you won’t have to feel left out at a gathering or sacrifice your sleep! Knowing how your body is behaving during the night can be a great tool for understanding the best time to go to bed, the best time to rise, and even the best temperature for your room. There are a variety of tools on the market that you can choose but I am particularly partial to the Oura ring, which rests so comfortably on my finger that I hardly even notice it. Rest and Restore™ is the perfect complement to a sleep-supportive lifestyle. Its natural ingredients can help promote restful sleep and an optimal sleep cycle. Without any next-day drowsiness, you can wake up feeling refreshed and ready to take on the day! 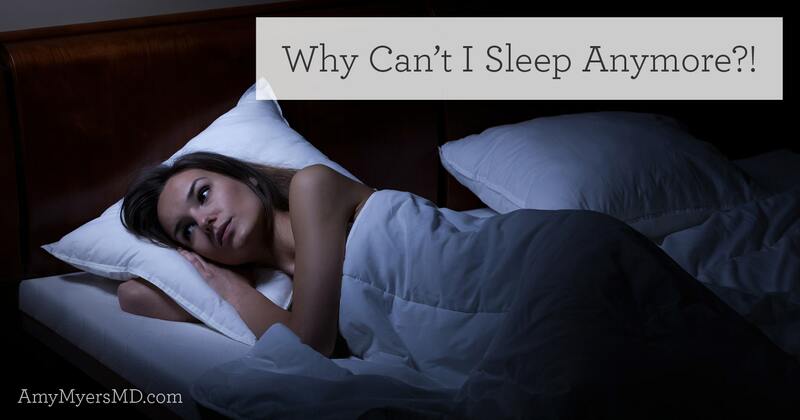 If you’ve been dealing with age-related sleep disturbances, you’re not alone. However, you don’t have to let your age define you: restful, restorative sleep is possible at any age! With these sleep supporting lifestyle strategies and supplements, you CAN overcome the common issues behind your sleepless nights, and reclaim your vibrant, energetic self!